It’s that time of year again when WFA has to start putting teams together for the start of the season in September for the Soccer Dome Junior Football League. We have to register a maximum of 40 players divided into 4 teams in each of the U7’s and U8’s age groups to play in the Soccer Dome Junior League. These two age groups will play every other Saturday at the Soccer Dome next door to Trafford Centre starting in September. They play up until Christmas when there is a short break and then again from mid-January to mid-February. Each of the players selected and registered with us will play one Saturday at the Soccer Dome and then the next Saturday with WFA at Ashdene and so on. The idea is to develop our teams from U7’s upwards until they reach Year 4 at school. We then pass them over to our partner junior football club, Wilmslow Town, to compete in the U9’s Timperley and District Leagues. We have produced some of the very best players and teams in the district following this procedure and we are the envy of every other club in the Manchester area because of the teams we produce from such an early age. To qualify for registration into one of the teams the children have to be in school Year 2 or 3 as from NEXT September. The school Year 2’s will make up our U7’s and the school year 3’s will make up our U8’s. To register you need to see either myself (Erik) or Alex Brown at our evening training sessions at Fulshaw St Anne’s or at Ashdene on Saturday morning. The cost of registration is £100 per child which includes the player’s registration fee, insurance, match fees and kit (which they will keep). The kit consists of shirt, shorts and socks. Cheques payable to WFA. Spaces are limited so we have to offer places in the teams on a first come first served basis. We will be starting registration from this Wednesday at Fulshaw at our Year 2 sessions from 6-7pm. We will then be taking registrations at the Reception and Year 1 session on Thursday evening from 5.30-6.30 again at Fulshaw St Anne’s. Any places left will be offered at the Saturday morning training at Ashdene. This is a brand new coaching course designed to promote the Spanish style of football while improving football specific fitness and encouraging a bit of competitive banter along the way. Taking place throughout the Summer Holidays starting Tuesday 6th August, the course will be run over 3 days each week, (Tuesday, Wednesday and Thursday) between 10.30am and 3pm at Lindow Primary School, Upcast Lane, Wilmslow. The 3 day course is £30 or you can turn up and play for one day for £12. As this is a coaching course, pre-registration is preferred. Email erik@academyfootball.co.uk to book your place with player name, age, contact info and dates of attendance. Download the Futbol Bonito leaflet for more information. With all this gorgeous weather, we can’t wait to start our summer camps. 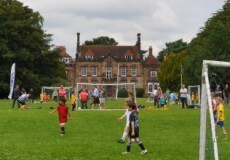 As usual we will be at Pownall Hall running every day from Thursday 10th July to Monday 1st September for 4 to 11 year olds. Click here for full details of our Summer Camps. Welcome to the newly refreshed Wilmslow Football Academy website.